EFI Technology specializes in electronic system design and software development for the aerospace & defence industry. Services include engine control systems, data recording equipment, mil-spec sensors, wire harnesses and custom software solutions. An unmanned aerial vehicle (UAV), commonly known as a drone, is an unmanned aircraft system. The flight of UAV may be controlled with various kinds of autonomy : either by remote control from an operator, located on the ground or in another vehicle, or fully autonomously, by onboard computers. The R4 ECU is a compact lightweight ECU for UAV engines up to 4 cylinders. It can be fully integrated with the UAV flight control system via CAN bus and features failsafe system redundancy. 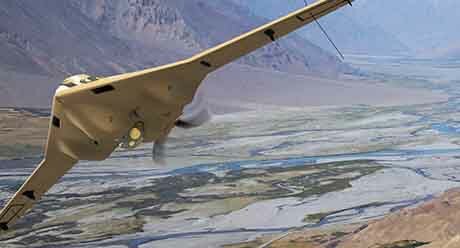 Fury is a long-endurance, survivable Unmanned Aerial System that brings strategic capabilities to the tactical warfighter. With the largest payload capacity and volume among runway-independent UAS, and its advanced heavy fuel propulsion system, best in class power generation, and low signature design. Fury is capable of supporting any Intelligence, Surveillance Reconnaissance and IEW requirement. Fury is runway independent utilizing a catapult launch and expeditionary recovery system. It has a blended 17-foot wingspan for minimal visual signature, endurance proven above 12 hours and altitude up to 15,000 ft. Fury can carry a combination of over 200 lbs of payload and fuel. The Watchkeeper WK450 is a Remote Piloted Air System (RPAS) for all weather, Intelligence, Surveillance, Target Acquisition and Reconnaissance used by the British Army, provided under a contract awarded in July 2005 to Thales UK. The Watchkeeper WK450 is based on the Elbit Hermes 450 UAV. The engine is a rotary Wankel engine built by UAV Engines Ltd that utilizes an EFI X3 ECU for its engine control system. It has a mass of 450 kg and a payload capacity of 150 kg, with a typical endurance of 17 hours. Watchkeeper's first UK flight took place on Wednesday 14 April 2010 from ParcAberporth in Wales. On 29 September 2014, the MoD revealed that Watchkeepers had become fully operational and sent to Afghanistan. General Atomics is a world leader in proven, reliable Unmanned Aircraft Systems (UAS) and tactical reconnaissance equipment. EFI Technology supplies a wide range of products to GA including engine control systems, mil-spec wire harnesses, lambda monitoring equipment and custom designed fuel pressure regulators. GA utilize the EFI R8 ECU for engine development programs, engine mapping and calibration and propeller endurance testing. It has an endurance of over 20 hours, with a primary mission of reconnaissance, surveillance and communications relay. The Hermes 450 is the basis of the British Army's Watchkeeper WK450, development of which started in July 2005 in conjunction with Thales. The engine is a rotary Wankel engine built by UAV Engines Ltd that utilizes an EFI X3 ECU for its engine control system.